So long white collar and blue collar. Now it's all about the "new collar" job. In the current technological economy, where factories and production plants are closed or workers are replaced by computers, those computers need to be maintained and programmed. Enter "new collar" jobs — positions that require some specialized education (typically in a technical field), but not a four-year college degree. And some companies have become so desperate for the right worker, they have started or invested in job training programs of their own, partnering with schools to equip students with the exact skills they will need to get a job, and then to do the job right. Delta, for example, has partnered with 37 aviation maintenance schools across the country to give thousands of students the technical knowledge needed to be an aviation maintenance technician (AMT) — and ideally to get them jobs at Delta down the road. Joe McDermott, managing director of Delta's cabin, training and support services, said that the schools were a mix of aviation and aeronautical institutes; community colleges; one state university, Utah State; and even one high school, Aviation in New York, adding that they were all chosen through an in-depth auditing process. Delta is looking to teach students the specific skills they will need to work for a commercial airline — the exact knowledge the company feels today's aviation programs lack. McDermott said the current curriculum as regulated by the Federal Aviation Administration is "very generic." It’s not all the schools’ fault, McDermott adds; part of the reason the system has been failing graduates is because the FAA has been slow to update the curriculum, wasting valuable hours on learning skills that may not even used anymore on commercial airliners. “A lot of what is being taught doesn’t quite align with the technical knowledge that is needed,” said McDermott, adding that even after completing the best training as an AMT (it takes 1,900 hours for an AMT to complete training, typically broken out into two years), additional training is needed and it takes at least a year of working with Delta before an AMT is cleared to sign off on anything. Delta’s strategy in partnering with schools is multifold: On one hand it wants to give students the education they need to fill future jobs — but the company also wants to shed light on what has traditionally been seen as a blue-collar job. And it pays well — salaries start at about $50,000 a year, McDermott says — has good benefits and flight privileges, and enables upward mobility. 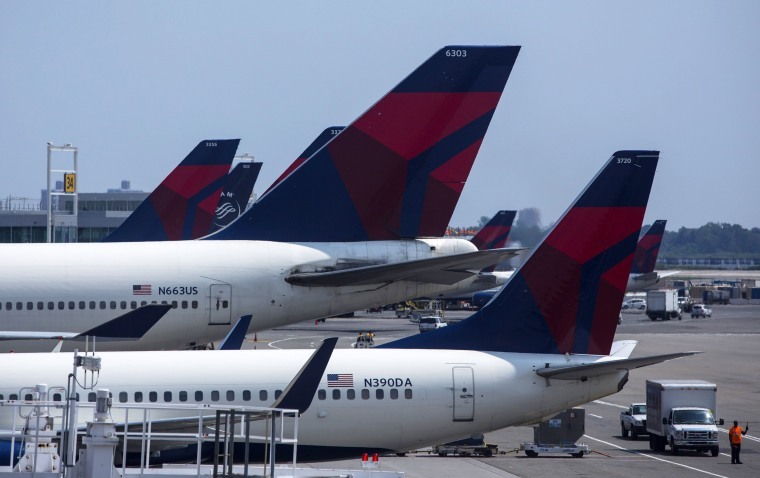 “After seven years with Delta, an AMT can make over $100,000 a year,” McDermott added. That said, it’s a lot of manual labor, and an AMT “may spend Christmas standing outside in the rain at LaGuardia,” McDermott said. "New collar" jobs have been popping up across a variety of sectors. Cathy Barrera, chief economic adviser for ZipRecruiter, a job search website, said that since January, the number of such jobs posted on the site each month has increased by 45 percent. Guy Berger, an economist at LinkedIn, declined to disclose data, but noted that these skills-based jobs, where knowledge is acquired through training or certificate programs, “are numerous and, in some cases, expanding into industries and functions where they didn't previously exist." "They cover a wide spectrum, ranging from electrical technicians to dental hygienists to web designers," he said. The Bureau of Labor Statistics reported that as of the end of June, there were 6.2 million job openings — a record high. Eugene Giovannini, chancellor at Tarrant County College in Texas (one of the schools partnering with Delta), identifies many of these openings as "new collar jobs that are unfilled as a result of an unskilled and under-skilled workforce." Delta isn’t the first company to recognize this problem of under-skilled workers and try to fix it. IBM, whose CEO Ginni Rometty coined the term “new collar” in an op-ed in USA Today last December, rolled out the P-Tech program, an IBM-sponsored six-year high school and associate’s degree that is currently available in several U.S. cities. While some go on to receive additional education, a good portion of the graduates go on to work for IBM, said Kelli Jordan, the company's talent leader for new collar initiatives. For now, there’s just not enough talent to go around — and in many cases, workers are getting scooped up before they’ve even graduated. At Lansing Community College in Michigan, one of the colleges Delta has teamed up with, there are 68 students in the two-year program that began this fall, said the college's president, Brent Knight. Although it can accommodate around 100 students, Knight anticipates a waiting list. "For the first time ever, the school is adding a second shift so that more students can enroll,” he said. For students like Jacob McDuffey, it's an opportunity to soar in a new career. "I'm learning exactly what they want me to learn," McDuffey said. "I think it's pretty astonishing."